These high low dresses certainly seem to be sticking around. I confess when I first saw them, I thought they looked kinda absurd, but the whole style has grown on me. Now, I rather like them. I’m also starting to kinda like skinny jeans. Clearly, there is something wrong with me. At the top of this paper doll dress, I put some beading/sequin/ruching detail. I think it could be any of those things, depending on how you color it. I was thinking a combo of sort of a beading and ruched detail when I drew it, but don’t let that stop you from coloring it anyway you like. That is, after all, the power of paper doll coloring pages- You get to decide what it becomes. Friendly reminder- the dark lines on the skirt should be cut along carefully, so you can wrap the back of the skirt around the back of the paper doll. 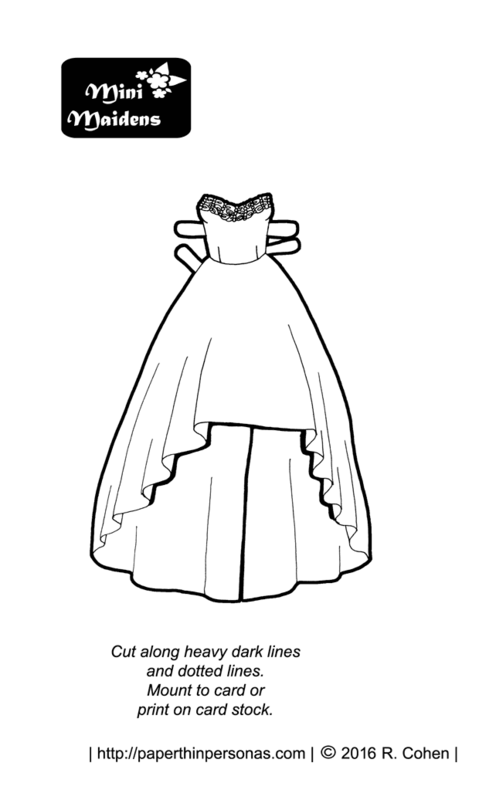 The shorter front of the skirt will fall over the front of the paper doll. This kind of trimming sometimes easiest to do with an Xact-o knife or razor blade, but if you use one, I would do it on a cutting board or some cardboard or something. All right, so I hope everyone enjoyed this week’s paper doll prom series. I certainly had fun posting them. Now, I’m going to go get ready for my weekend and also be grateful that my parents replaced that counter-top before I ever had to explain any youthful antics involving paper doll coloring pages and Xact-o knives. Ignoring my childhood misadventures for the moment, please consider taking a second to tell me what you think of this new pattern of posting and/or support the blog by becoming a patron. One suggestion is to maybe put everything on one printing page when you do a roundup, if that’s possible. I also like the more in-depth commentary on the pieces that’s possible with the new format. Before it seemed like maybe a sentence or two for each piece, and I like that you share more thoughts with the new format. I do realize that for some readers this new format isn’t nearly as convenient as being able to print out a single sheet, but after a lot of thought, I felt that it was a compromise I was willing to make to gain back the time I was spending on layout. Layout not only limited the number of pieces I could create, but it was actually one of the most time consuming parts of the process, so I have let it go. I’m so glad you enjoyed Accessory Thursday. It’s turned out to be one of my favorite days of the week. Thank you, Cathy. I’m so glad you like it. I like the new format, but then I also found the backgrounds of the old format somewhat busy sometimes. And besides, you are kind enough to take your time to make these for us, so if this format is easier for you, than I say GO FOR IT! Thank you! This has been a fun week, wondering what’ll be coming up next.